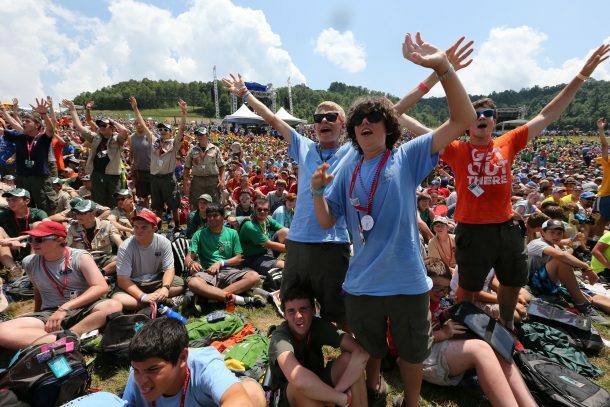 Want to experience the fun of the 2017 National Jamboree but can’t be there for the whole 10 days? Bring your family or friends and live the adventure for a day or two — or more. The Jamboree is July 19 to 28 at the Summit Bechtel Reserve in West Virginia; visitors are welcome July 21 to 27. The per-day visitor price? Less than half the cost of a day at Disney. Learn more and buy your visitor passes today. Read on for additional details. This year there are two types of visitors: observers and participants. It’s helpful to go over each separately. Visitor access to activities is based on availability. Activities may be closed because of unsafe weather conditions. Jamboree visitors can visit with participants, but visitors do not have access to the base camps or participant-only activity areas. Do bring water bottles and a small daypack. Wearing sunscreen and a hat is a good idea, too. Don’t bring a backpack, picnic basket or cooler. Where do I park, and how do I get there? You’ll park in a visitor lot and hop on the visitor shuttle to get to the entrance. Visitor shuttles run regularly, and the cost is included in your Jamboree pass. Is there a video about Jamboree visitors that will get me really excited? OK, I’m in. Where do I buy my tickets? Learn more and buy your passes here. See you at the Jamboree! Email 2017.jamboree@scouting.org or call 972-580-2489.